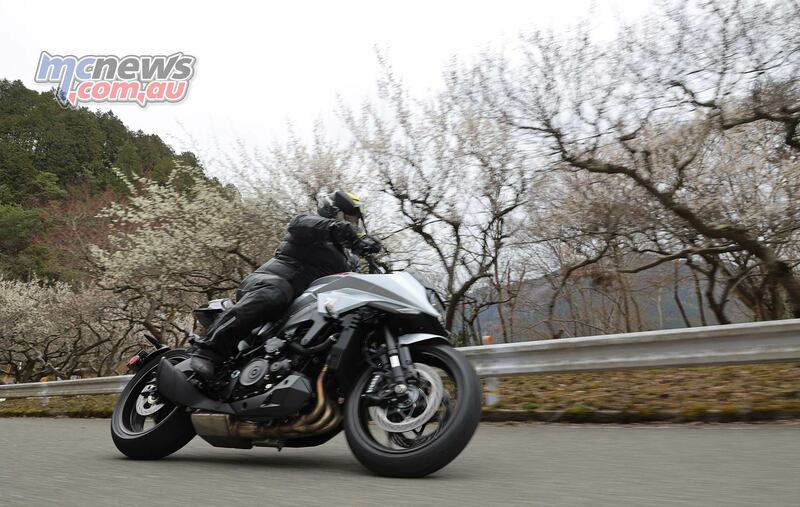 Suzuki Chief Engineer Saturo Terada, made it clear to the assembled press contingent at the world launch, staged amongst the bamboo forests that line Arashiyama-Takao Parkway, that the new Katana is not a ‘retro’ bike. 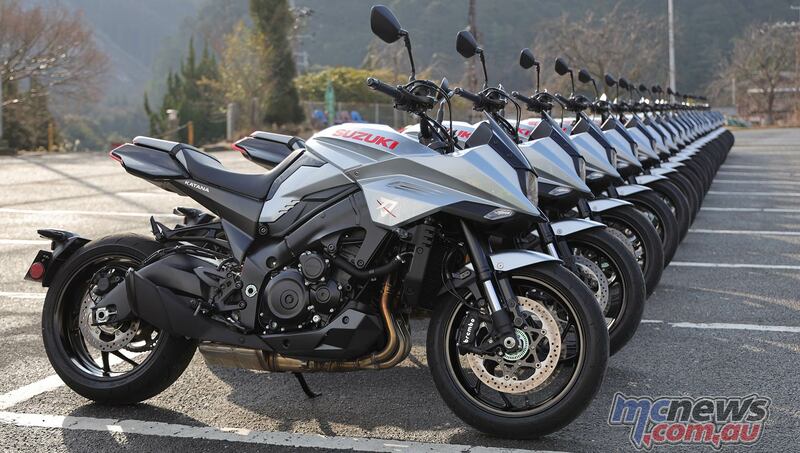 It is instead a thoroughly modern interpretation of what Suzuki feels a modern take on Katana should represent. That said, there are certainly plenty of nods to the heralded past of the original Katana machines. Not least of course the name, but also elsewhere throughout the design language employed, which has clearly translated from the script of the original Katana. 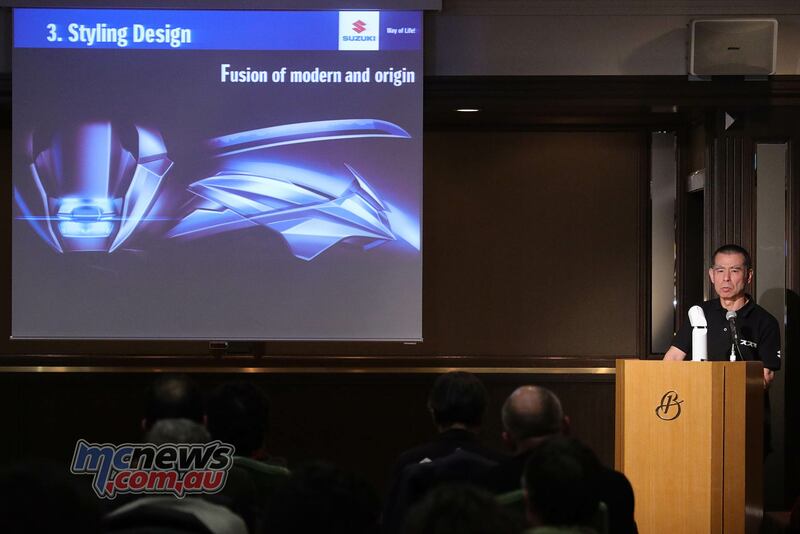 When the design proposal was first unveiled two years ago at EICMA it caused much excitement among enthusiasts. Once the necessities for a production machine were added, such as a number plate, along with legal sized indicators and mirrors, the gloss perhaps faded a little. It started to look a little more pedestrian, something I guess that is largely unavoidable when you have to add those mandatory items to achieve road-registration. 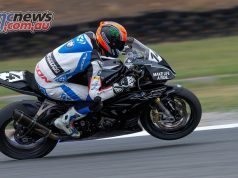 Upon seeing the machine in the flesh for the first time at the Australian MotoGP event last year I was still not overly enthused by the styling. After spending some extended quality time with the Katana in the place of its birth, it gradually did start to win me over. I love the head-light. It is a bit retro but at the same time thoroughly modern. 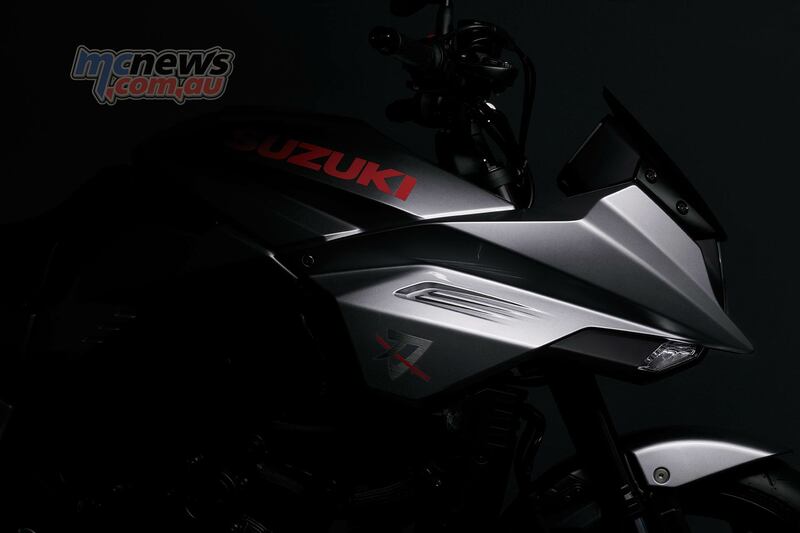 I reckon Suzuki could have even made it a bit larger, for an even more nostalgic look, but overall it is beautifully executed. The hue of the LED lighting and the way it is stacked, with a small separator in the middle, flanked by two more small LEDs, I find incredibly appealing. 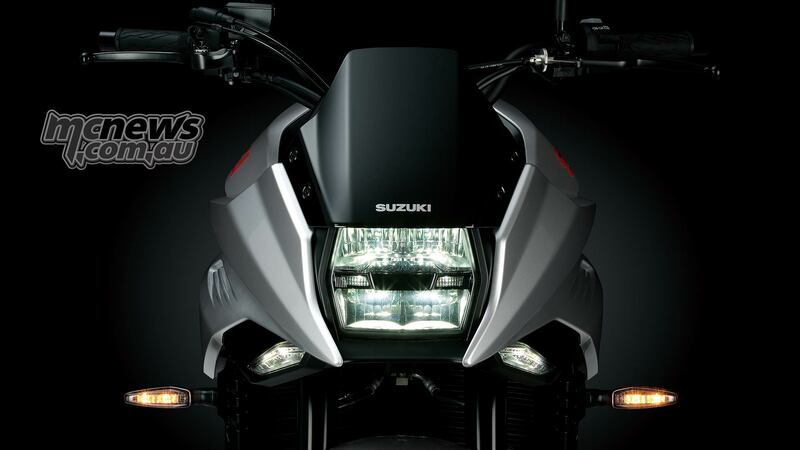 Two more ‘position’ lights, situated below and to the side of the main headlight, add further distinctive appeal to the face of the Katana. The way the bodywork is layered around the head-light and then extends into the almost flat-front binnacle that hides the instruments is clever. The frontal silhouette of the Katana is a clever piece of design. I can’t illuminate you as to how well that funky headlight works at night though as we never got the opportunity to put it to the test. 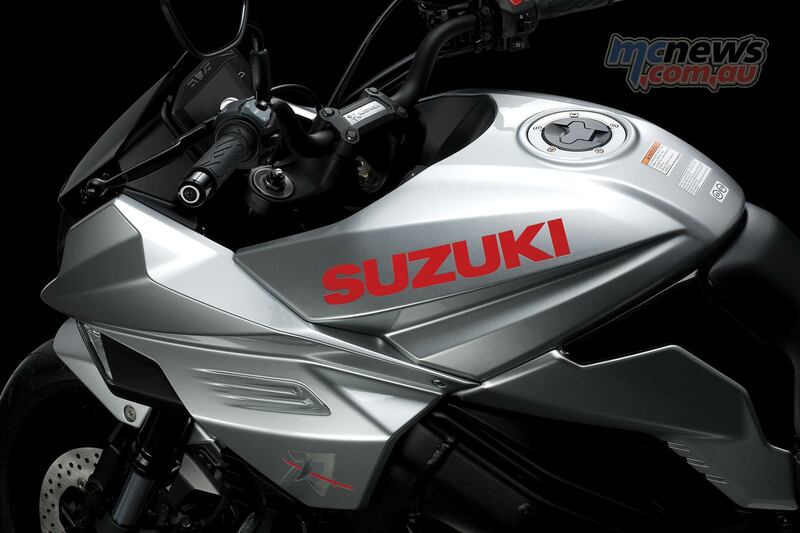 The fuel tank cover, with its prominent Suzuki lettering, is a clear homage to the original Katana. The stepped black-grey seat also has a hint of yesteryear to its shape, but has a much firmer form and padding than the bike it took those cues from. 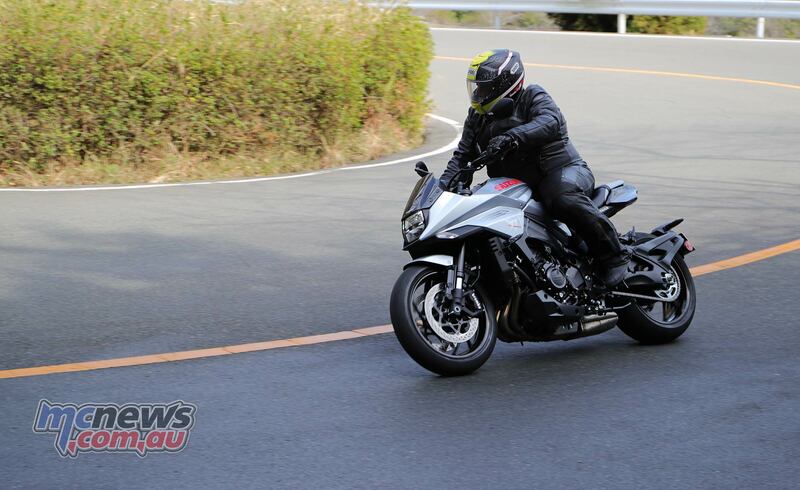 It is slim between the knees which aids ingress/egress to/from the bike and at 825 mm from terra firma, it makes getting on and off the Katana a thoughtless process. The rider triangle positions you quite upright, but also gives a sporting rider plenty of room to move around the machine, positioning their weight where they want it for any given corner. It left me with nothing to complain about. Pillion accommodations look not too bad, complete with an old-style seat mounted panic strap to hold on to. 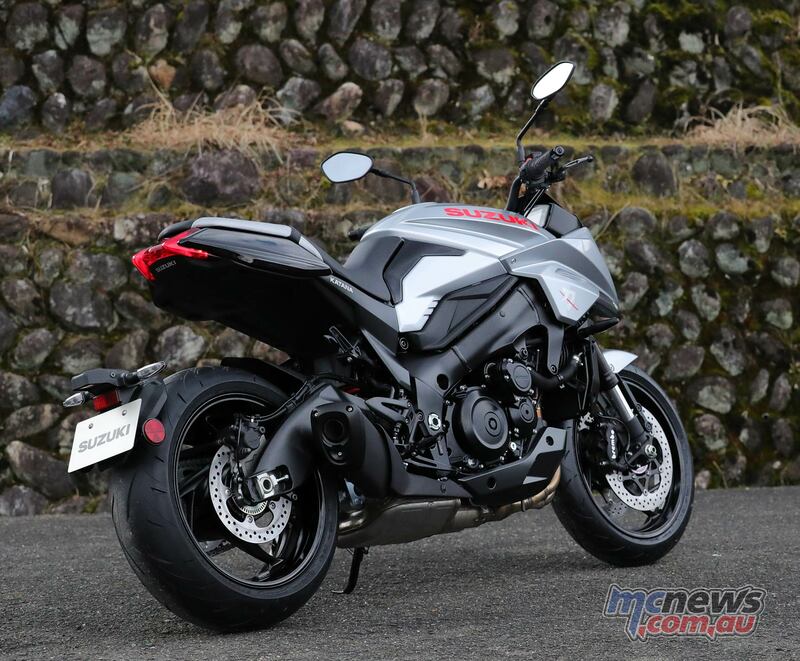 As with any largely naked motorcycle, the engine also forms a highly significant part of the look. 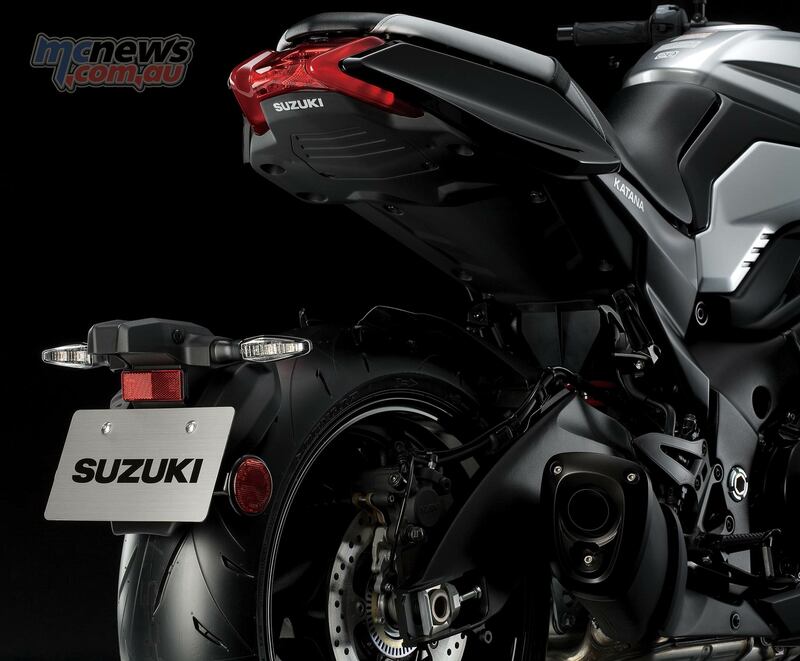 For a donk never designed to be seen without a fairing covering it, the well-proven long-stroke version of the highly successful engine from the K5-K8 generation of the GSX-R1000 not only pulls hard, but looks good doing it. I am a little concerned as to how easy it will be for owners to keep the engine looking good in the long term. But the smooth matt black finish on the engine does look high quality, thus hopefully my consternation will prove misplaced. 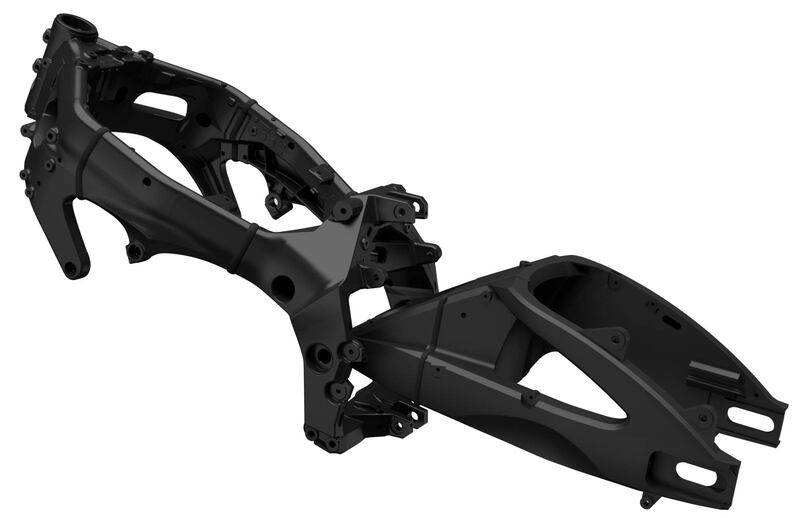 The massive swing-arm also comes from the GSX-R1000 parts catalogue, sourced from the 2016 model. 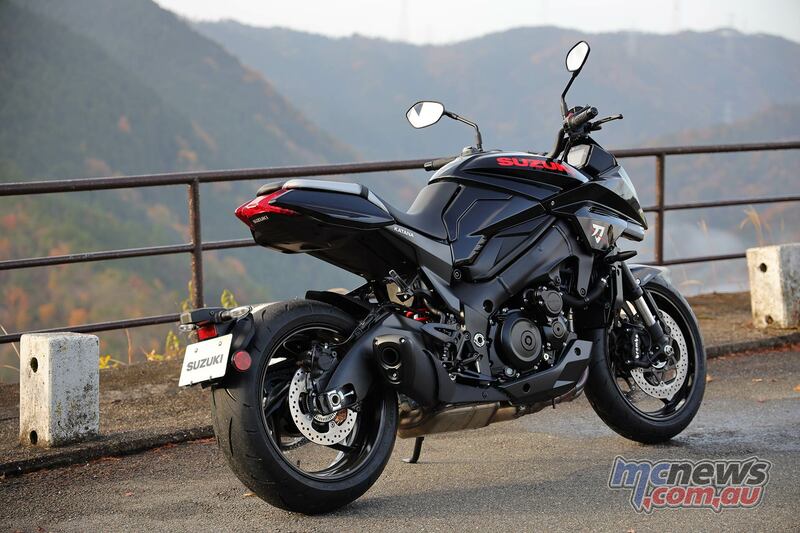 The way its sturdy bracing bends its support is almost reminiscent of the banana swing-arms of the RGV 250. Be nice if it was bigger again though, and somehow managed to hide that monstrosity of a pre-muffler and catalytic convertor that hangs in shame beneath the machine. 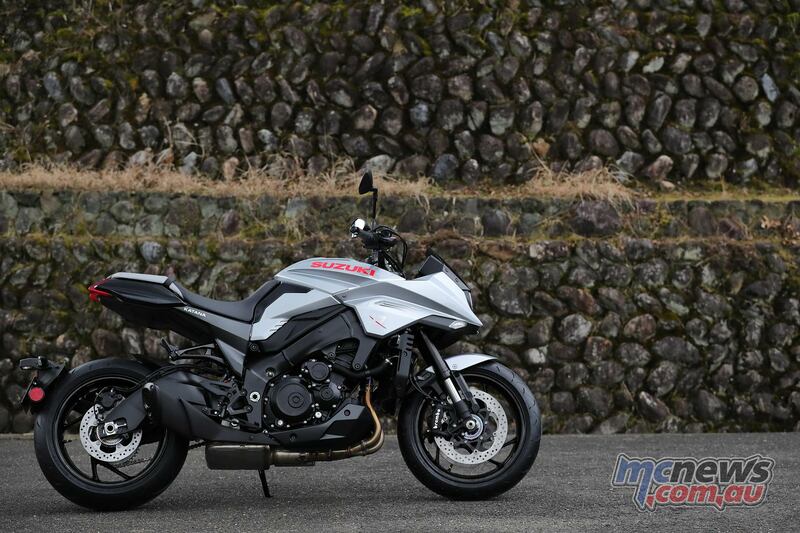 The short upswept muffler looks okay, and its end cap is actually detailed quite nicely, but if I took a Katana of my own home then that ugly expanse of steel under the bike would have to be destroyed in some sort of ceremonial burning. Perhaps I would even wear a Hakama while doing it. 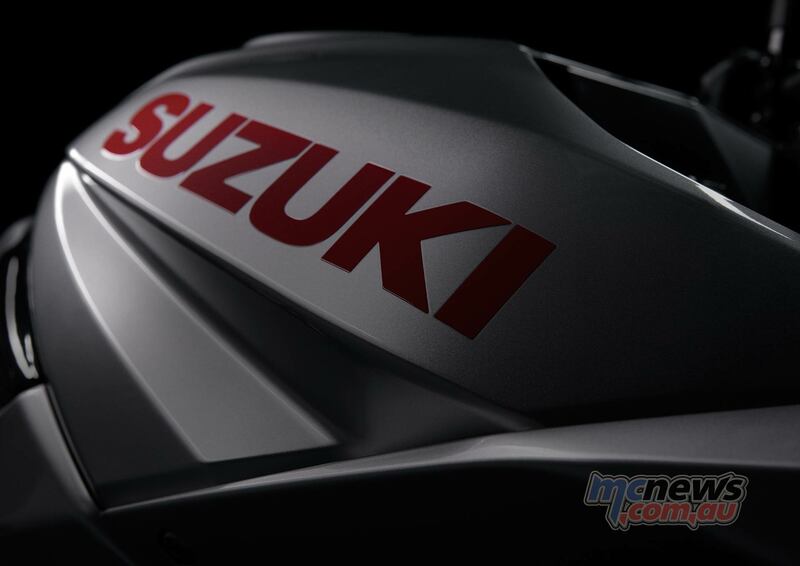 At the tail of the machine Suzuki have gone for a very clean look, an LED tail-light formed into an interesting shape that almost tucks under the seat. I actually quite like it, and the normally bland surfaces of the inner guard actually look to have come in for some serious attention to detail. 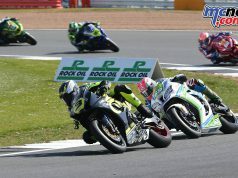 Suzuki explained that this took some time to get right in regards to the air-flow over the bike, to ensure there were no adverse effects on stability. 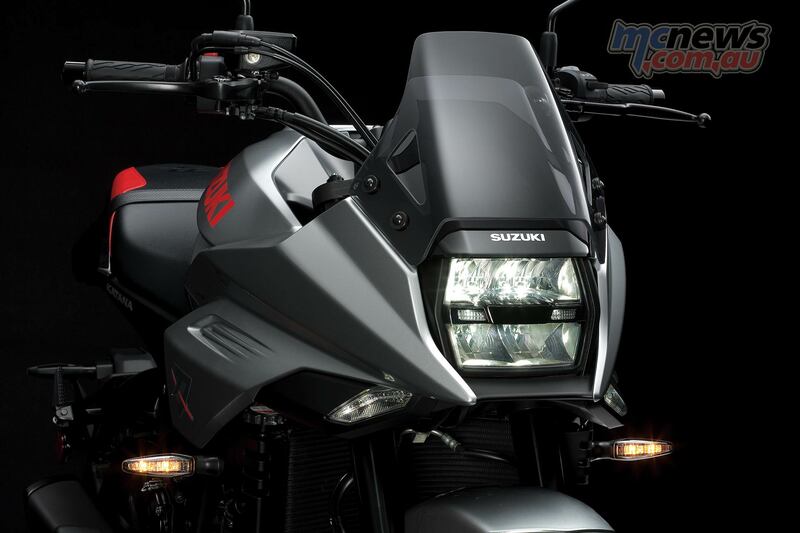 A small hugger is mounted to the left side of the swing-arm and carries the number plate and indicators. A lot of owners will be junking that as soon as the first good under-tray kit hits the after-market, but I don’t mind it. 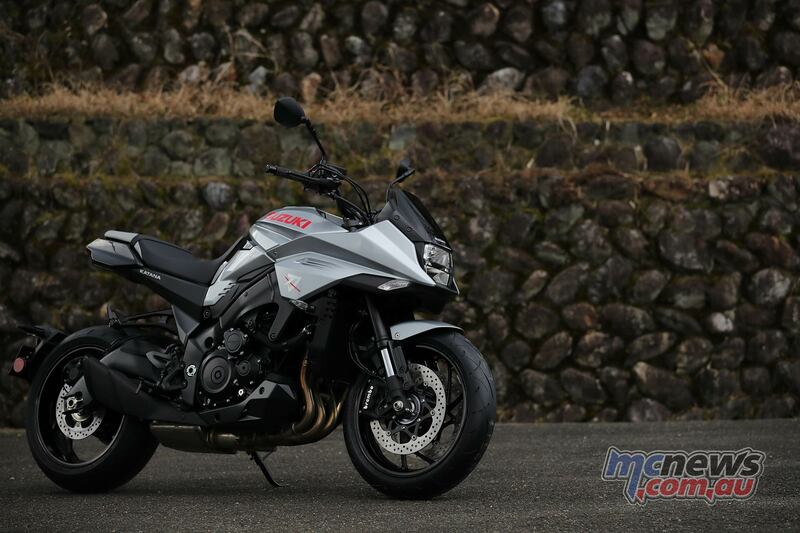 It is the first time Suzuki has fitted such a number plate hanger, and like so many parts of the Katana, there is some clever attention to detail employed to carry it off. 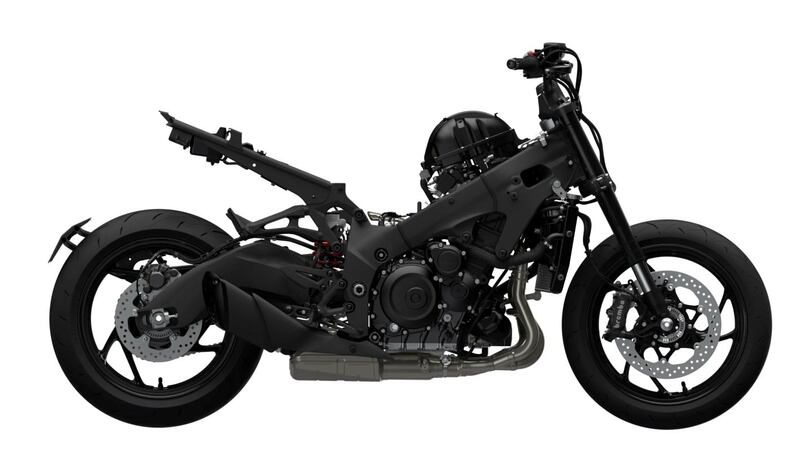 The overall silhouette of the Katana is not the most handsome in motorcycling by any stretch, but there are numerous instances where you can see the design work that has gone into making the individual parts of the machine. These touches are quite endearing. 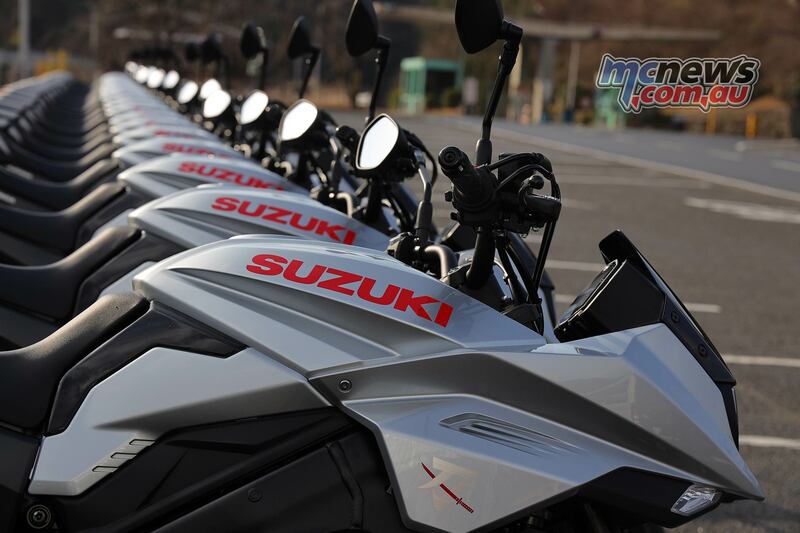 Suzuki’s latest buzzword about their brand, which they are now seeking to underline, is ‘monozukuri’, which loosely translates to craftsmanship. As much as my jaded, 20-years as a motorcycle reviewer bloodshot eyes glazed over when I first heard it mentioned, in the details of this machine that word actually fits just fine. In fact, it was seeing all the work that had obviously gone in to all these little fine details, that really started to charm the Katana in to my consciousness. 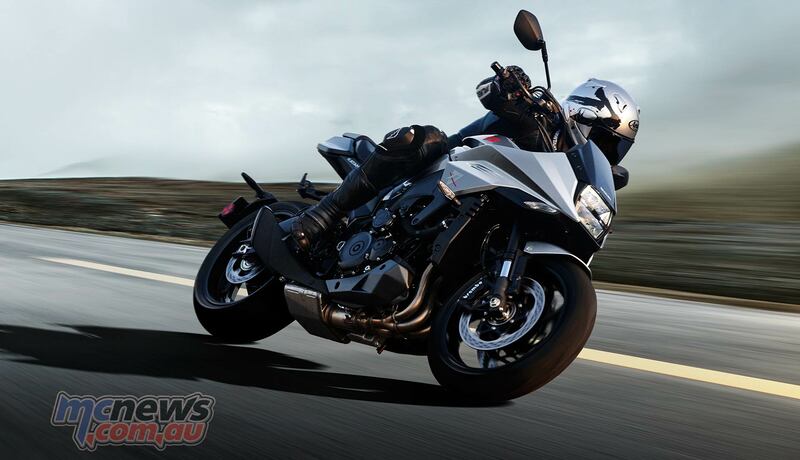 Just as the original Katana itself was spawned from the GS/GSX models of the early 1980s, this latest iteration is based on Suzuki’s current generation GSX-S1000. That means modern clever engineering with a sturdy, but light, twin-spar alloy frame, suspension that works quite well, radial-mount four-piston calipers and contemporary electronic aids such as ABS and traction control. Braking power proved strong and progressive, but with ambient temperatures not far above zero throughout the test I did not get to judge their maximum outright stopping power. 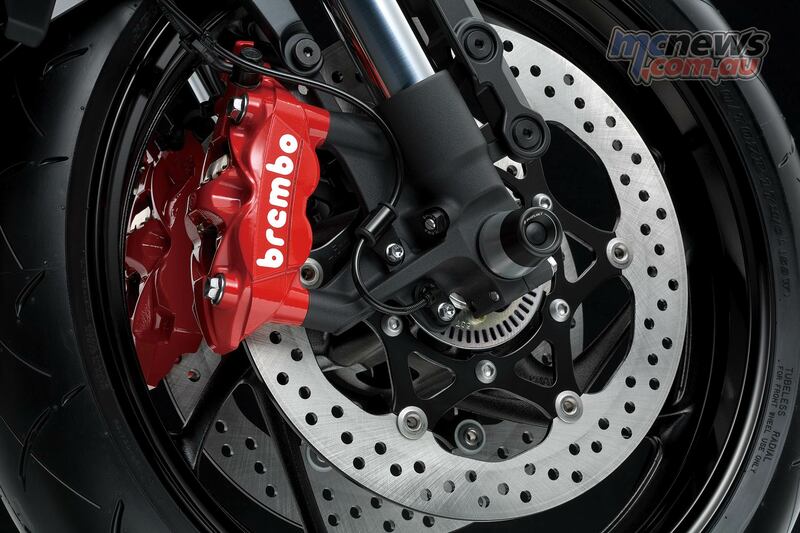 The Brembo hardware though is lifted from the current GSX-R1000 no less, thus I am sure they are more than up to the task. The ABS system is not quite current top-spec kit, its sample rate is fast enough to be unobtrusive, but it does lack lean angle data in its algorithms. You can even option red calipers if you so choose. Likewise the traction control system is not of the lean-angle sensitive variety, but in real world use it caused me no bother. Those freezing conditions, I actually saw snowflakes falling outside my hotel room window earlier that morning, and patches of damp asphalt, saw me exercising a little more caution than normal. With the traction control on level three the TCS light was going ballistic on every corner exit, although I felt no real intervention or significant dulling of the power. I switched to level two which saw the warning lights settle down and just got on with the job. The system retards the ignition to reduce power when it senses tiny amounts of wheel slip, and only becomes more intrusive to the point of clear ignition cut and throttle butterfly modulation when the situation has really become quite dire. Charging proper hard on a good day would see you run the system at level one, but I fail to see any scenario, apart from extended wheelies, that would require the system to be turned off. The lead Japanese rider from Suzuki controlled the pace of the ride in the conditions, despite me giving him the hurry up. 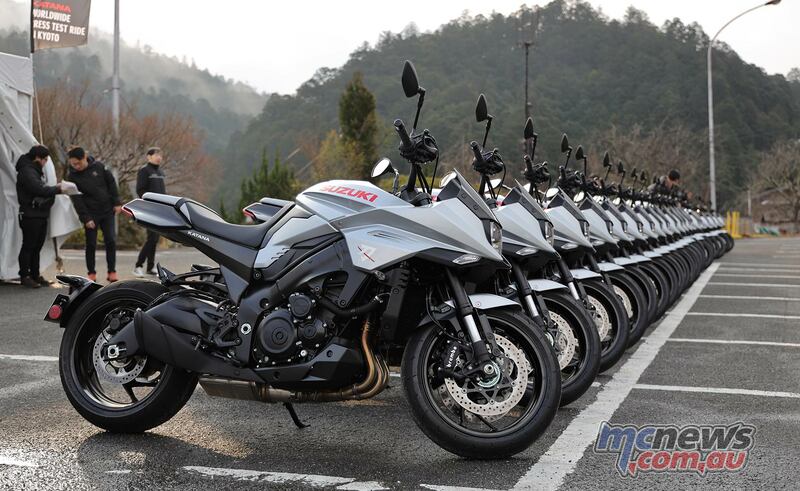 The attractive TPR built six-spoke cast alloy rims were shod with new Roadsport 2 Dunlop rubber. Concerned senior Dunlop techs were on hand to check on their performance in the chilling conditions. They not only constantly checked tyre temperatures, but also the hardness of the rubber with a type of instrument I had not seen before. Even after our most spirited runs, tyre temperatures never registered more than 26-degrees celsius. They had the pressures set at 36 psi in the 120/70-17 front and 42 psi in the fat 190/50-17 rear, which many people would consider quite high, but the wonders of science that produce modern road rubber mean that these days we don’t have to run lower pressures to get grip. Of course, racing straight off tyre-warmers on super sticky compounds that are only good for a dozen laps are another kettle of fish. This is a road bike on a public road, and it is a great testament to the tyres, along with the grip levels offered up by the Japanese bitumen throughout Arashiyama-Takao Parkway, that our group all remained upright in conditions sketchy enough to put the fear of god in to many motorcyclists. A rider had gone down in a previous group when experimenting with the traction control off, this was not an opportune moment to be playing silly buggers. 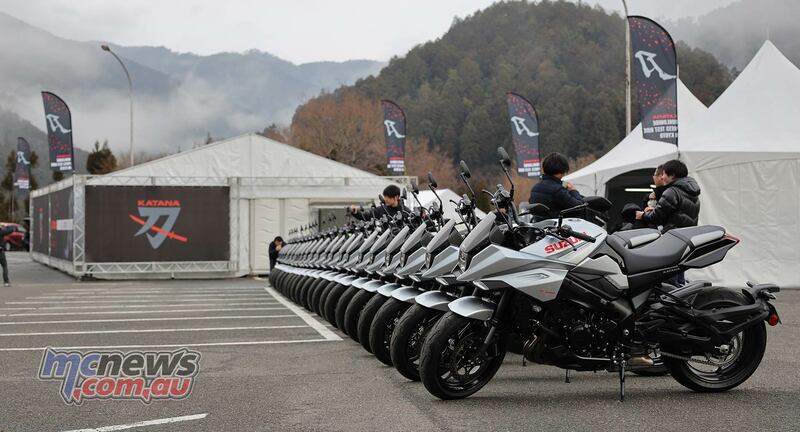 The composure of the fully-adjustable KYB suspension also played its part in keeping us safe. After my first run saw the front deflect a little more than I would have liked, over some changes in surface and bumps, I did firm up the rear a little. 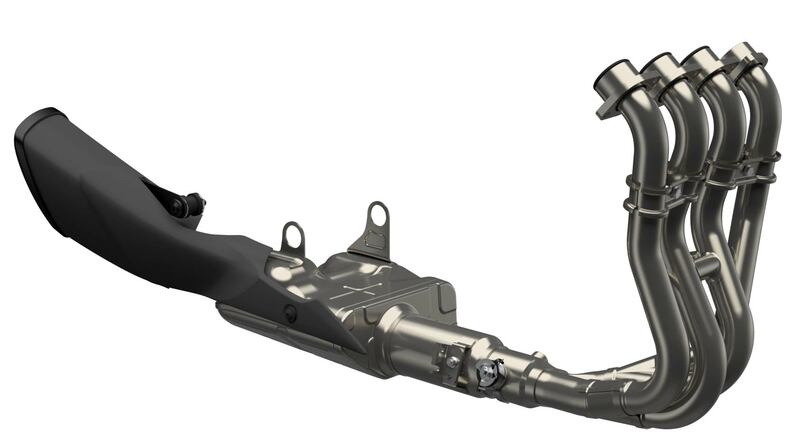 So often it is the tail that wags the dog in these cases, and for any front end concerns, at road speeds, the rear shock is always my first port of call, and almost always is what helps to give more precise and settled steering. With a little more pre-load and damping dialled in at the rear my complaint was cured and, at the moderate for us, but probably still quite decent public road pace for most, I was a happy camper. The long-stroke engine from the K5-K8 has earned a well deserved place in motorcycling folklore, and for good reason. 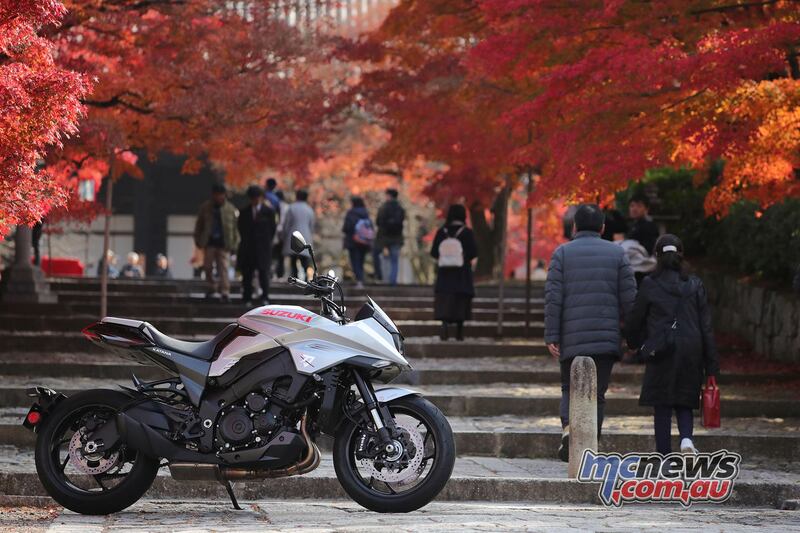 The Katana sees it in the same somewhat moderated, but still pretty bloody impressive, 150 horsepower and 108 Nm level of tune that we first sampled in the GSX-S1000. 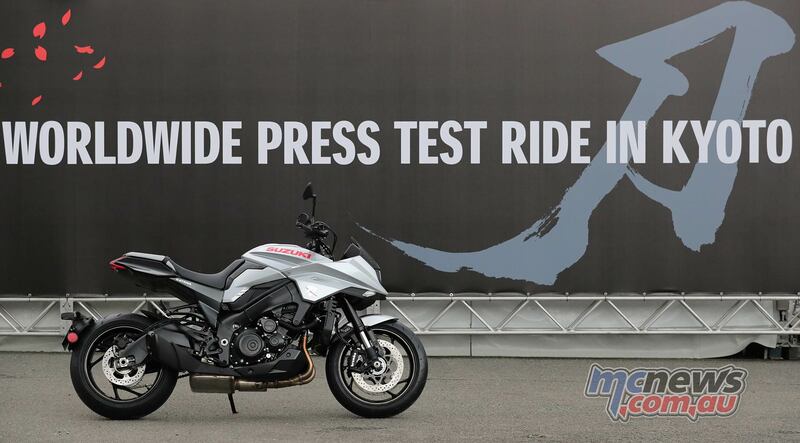 They have changed the throttle cam for the Katana to help smooth initial application, with the first part of the throttle turning at lower ramp rate, to help reduce any abruptness on pick-up from closed. However, I favour the more linear throttle roll of the GSX-S1000. That might surprise as many testers, and owners, maligned the sharpness of the GSX-S throttle, but I thought it precise and enjoyed feeling that level of accuracy at my fingertips. 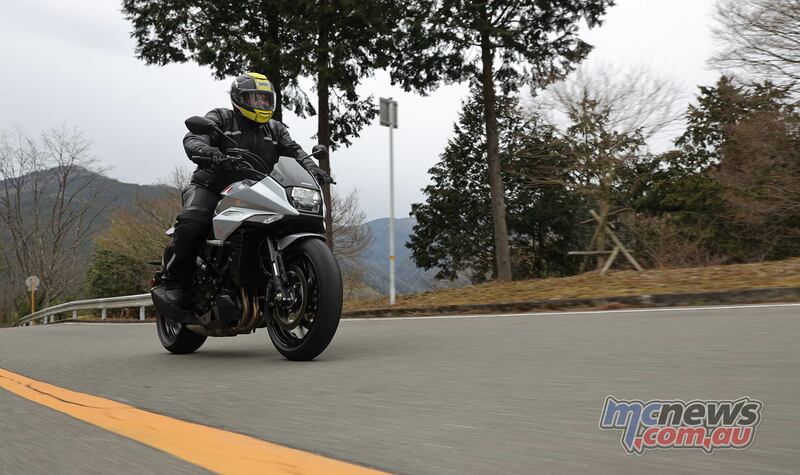 It proved accurate enough on the GSX-S to do countless five-gear wheel-stands, and that’s without the get-out-of-jail-free card of a rear brake due to my fused ankle, so clearly I had no issue with the GSX-S throttle. I always find it refreshing when I get on a bike without a ride-by-wire throttle, more care is required at the right wrist, but I find that fuels a big part of the riding experience for me. 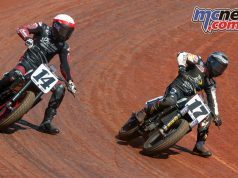 I want to feel all of that horsepower when I want, and coming on at the rate I decide, not at a rate the computer dictates after deciding you are too stupid to operate a throttle effectively. It does have that low-rpm assist mechanism though to help prevent stalling. When you select first gear it raises the idle to help cater for people who really should just instead suffer the embarrassment of stalling and falling over at a stand-still. 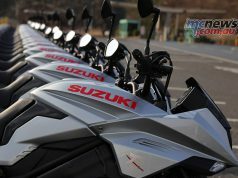 If they are not competent enough to operate a clutch and a throttle from stand-still, they are certainly not qualified to control a 150 horsepower motorcycle that weighs in at only 215 kg wet. 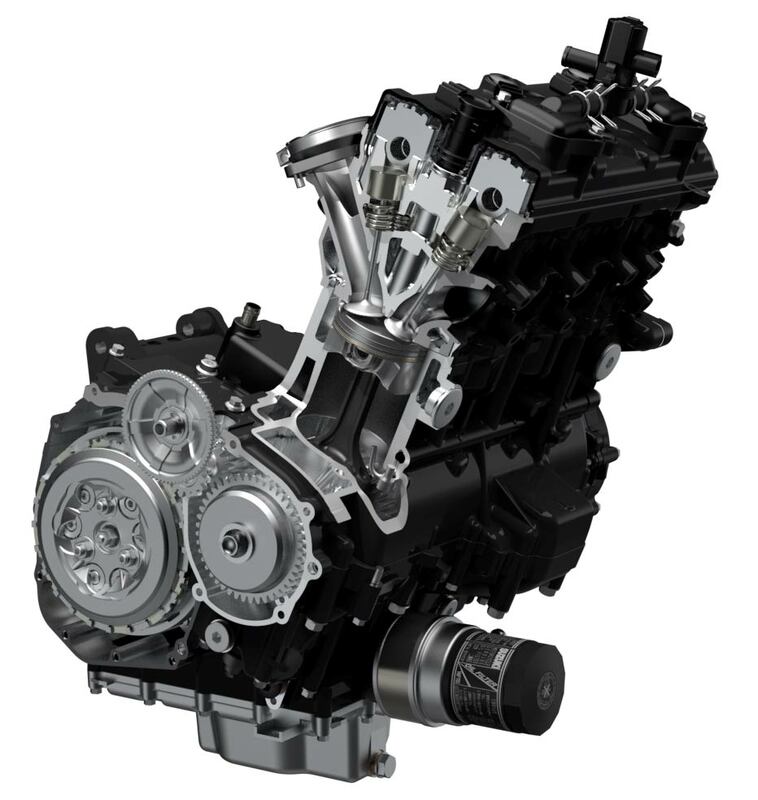 The 999 cc engine is a gem with tight switchback hair-pins negotiated in as high as third gear, once you have some corner speed confidence happening. It then builds into what really is still quite a storming top end that peaks at 10,000rpm, but with still plenty of useful over-rev in reserve, should you wish to save a gear change between turns. 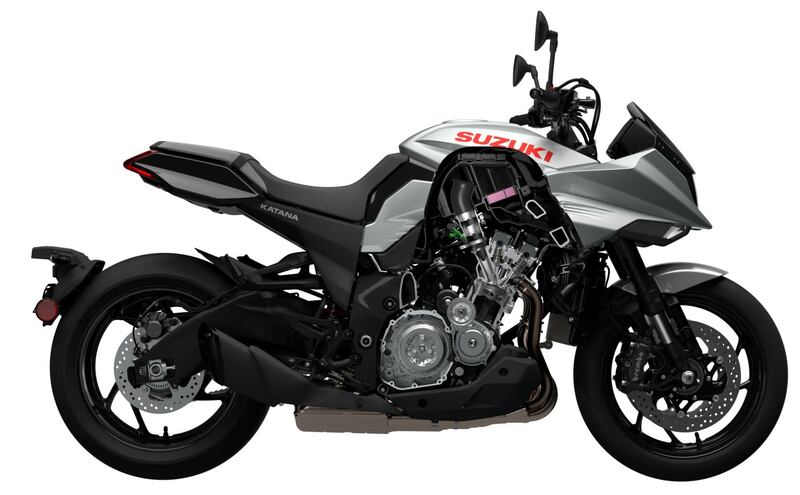 To be honest the bike doesn’t really need more grunt, but I really wish that Suzuki had made this bike just that little more special by stretching it towards that 1074cc of the original GSX1100SZ. 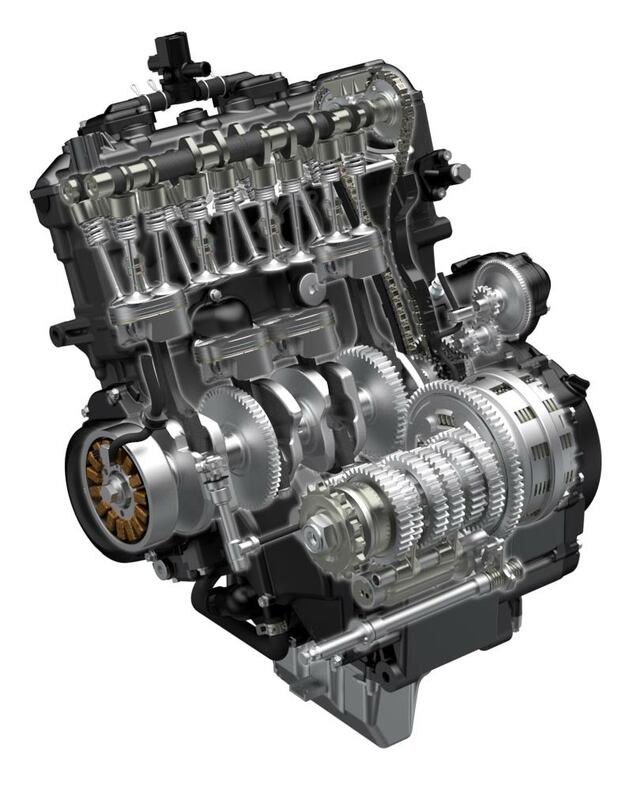 Cost and development time are of course the reasons why, and at least in this well-proven spec’ you can be comfortable that this engine and gearbox will probably out-last some of its owners. 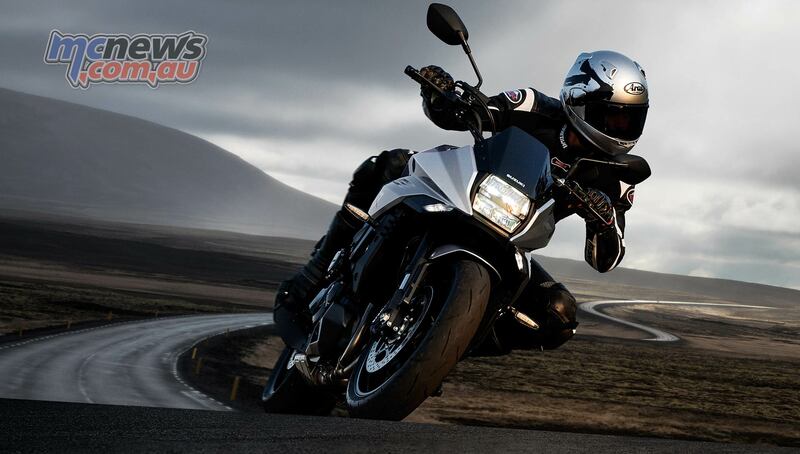 There is no quick-shifter nor any electronic engine braking control. It doesn’t need them, the gearbox is faultless and the slip-assist clutch is light and effective. 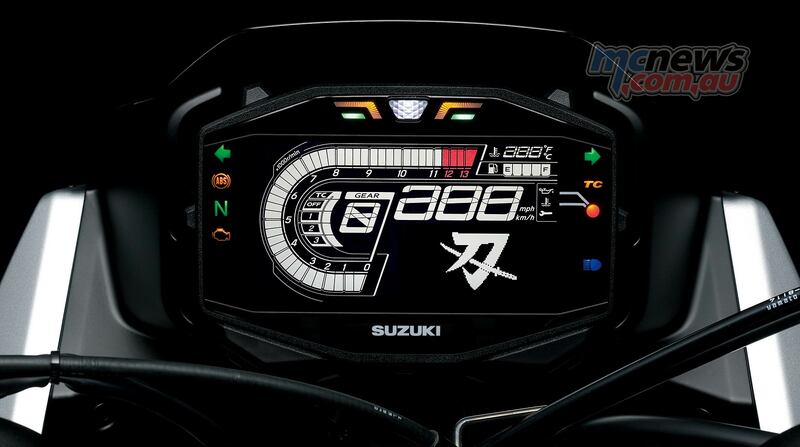 The instrumentation is reminiscent of the current generation GSX-R1000, but uses a font that is a little Super-Nintendo style retro. There is a lot going on, but it is all fairly clear and logical. The LCD tacho is naff, as they all are, but the rest of the display works well. 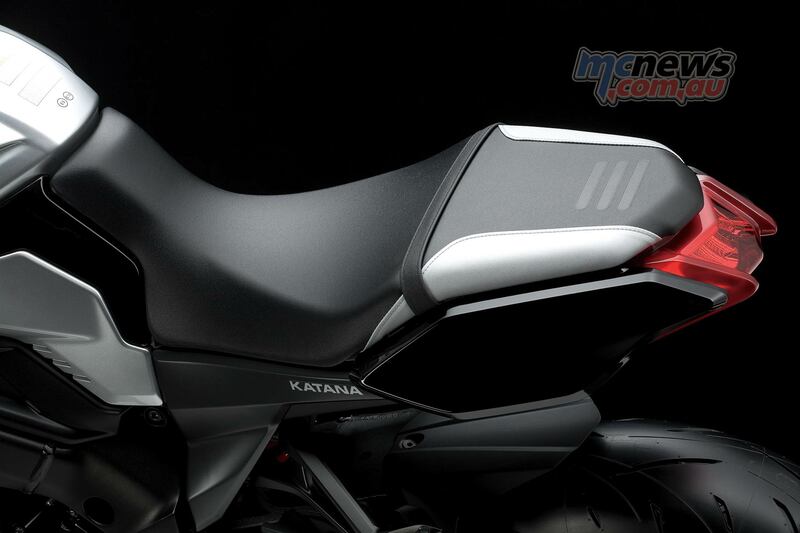 After the speed readout it will be the range to empty display that gains the next most attention as the new Katana only sports a 12-litre fuel-cell, 10-litres less than the original. The difference in range between the two though would not be quite as marked due to the efficiency of the modern oil-water-cooled and fuel-injected power-plant. Unless you are stretching the cable out of high-speed fourth and fifth gear corners all day, your range will still be over 200 kilometres in almost every scenario. 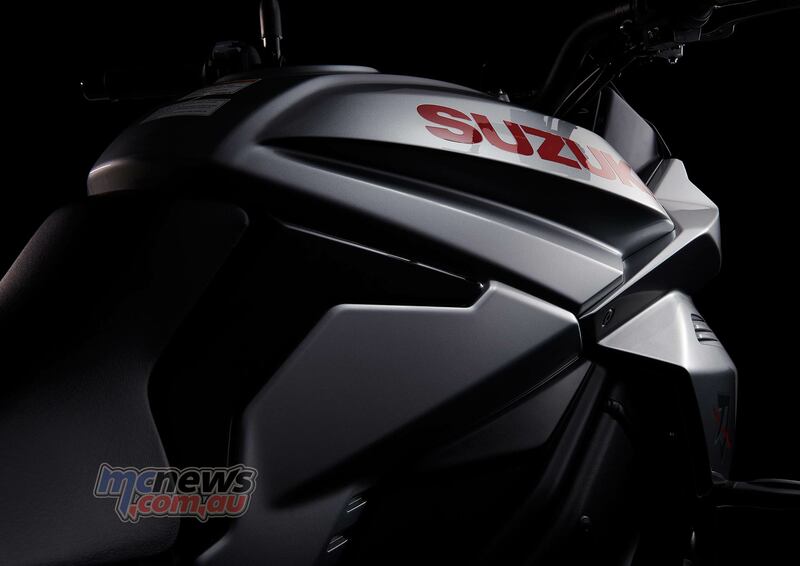 Suzuki Australia have confirmed that the new Katana will start arriving in September this year (2019), and will retail for $18,990 Ride Away. 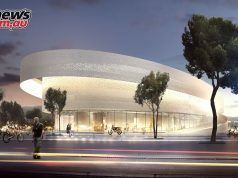 70 per cent of the first shipment of sixty units are already pre-sold to customers. 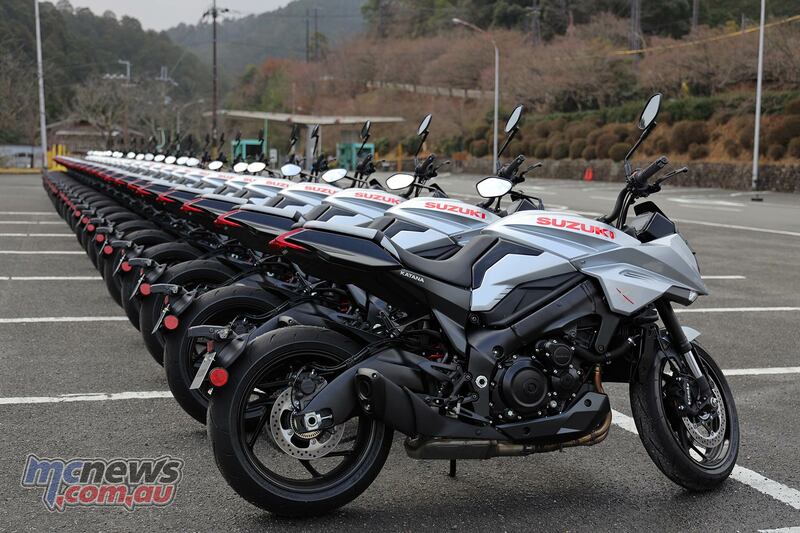 Suzuki expect to sell 100-120 Katana, of what is expected to be a global production run of around 4000. 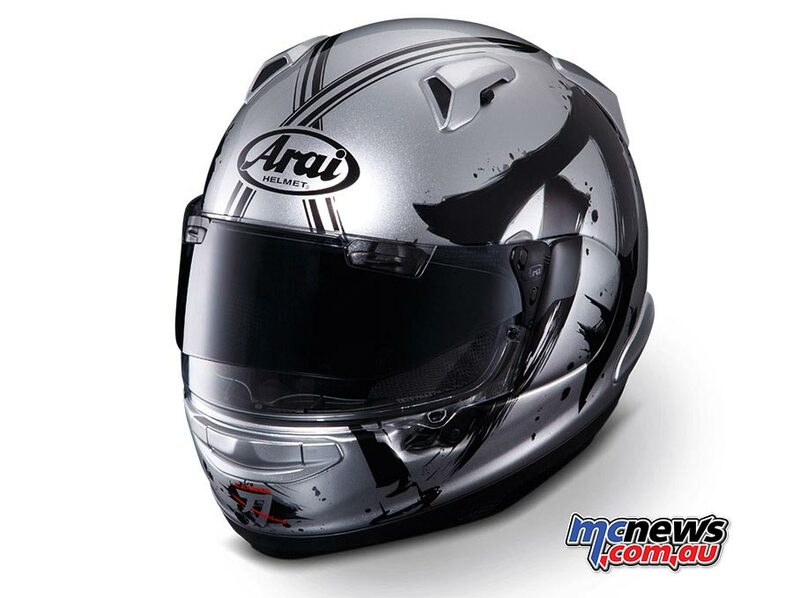 All customers who pre-order their new Katana online from the first shipment will also receive a bonus exclusive Katana themed Arai QV-Pro helmet, valued at $995.